Willys dealerships were using promotional models very early after World War II to help sell their vehicles. Enticing customers into their showrooms and letting kids take home a vehicle dad was considering purchasing, made for good advertising. 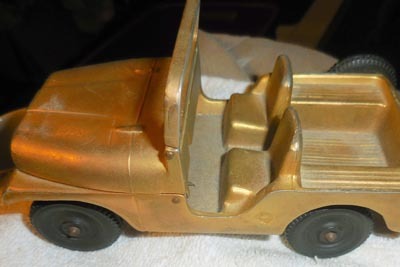 Just like the image Willys was trying to portray with their 1:1 vehicles, the models were solidly made to withstand years of abuse. 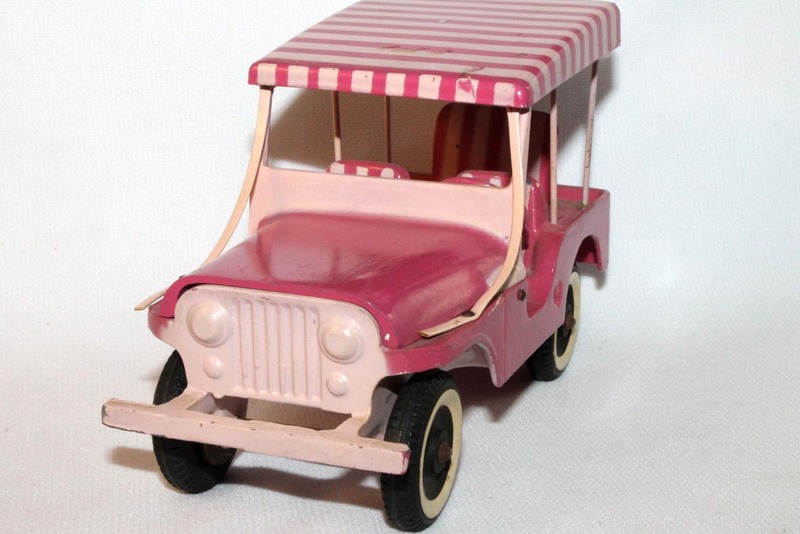 The promotional models on this page take over where the first generation Al-Toy and Oglesby models leave off at the end of the 1950s (see Al-Toy Aluminum Toy Jeeps). Unlike those earlier "Tonka sized" models, the second generation models were 1:25 scale. A display of cast aluminum dealer promo models (30K JPEG) at the Spring Willys Reunion in Wausau, Wisconsin in May 2001 shows some of the smaller models in front of the larger Al-Toys. 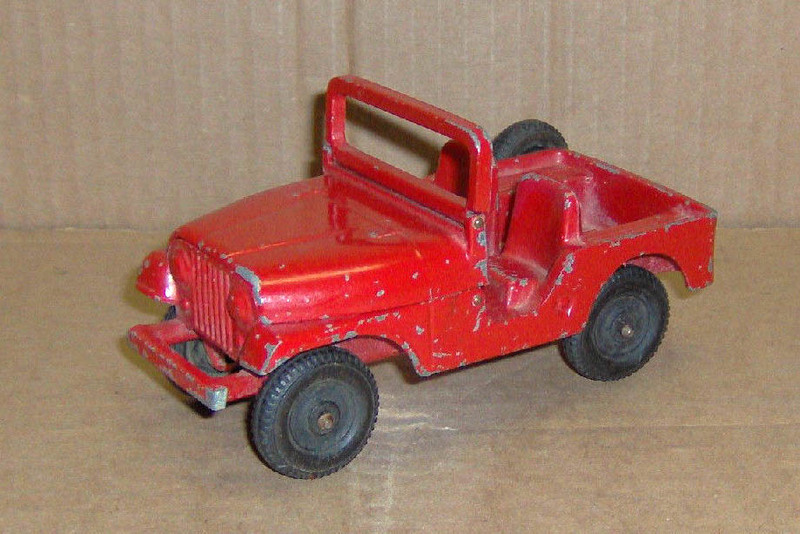 Jeep dealers were not unique in using promo models, as just about all auto manufacturers had plastic 1:25 versions of their cars in their dealerships by the 1960s. Comet had already made a name for itself with the wartime production of Authenticast identification models (see World War II Jeep Recognition Models), and although in 1950 it produced a Willys Station Wagon model (30K JPEG), it was the CJ-5 casting that became the most prolific of the second generation dealership models. 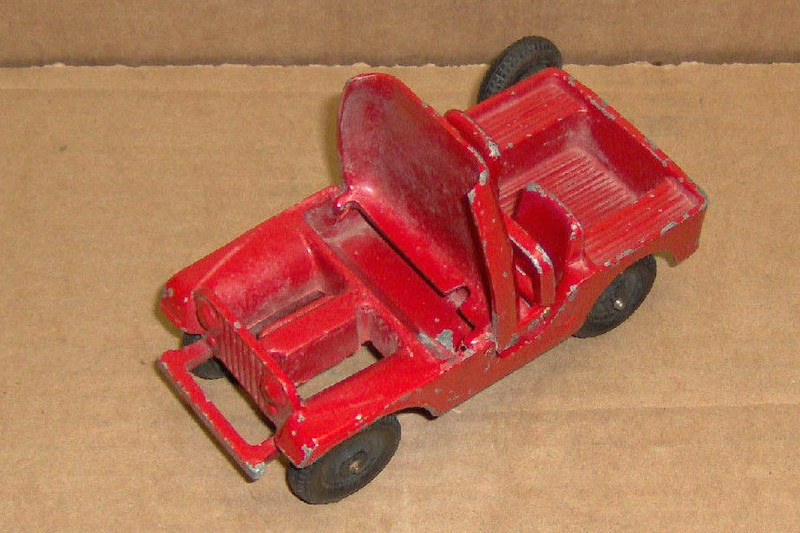 Very similar in overall construction to the larger aluminum models (see one with a larger Oglesby, 40K JPEG), the CJ-5s were very solidly cast in aluminum with rubber wheels on steel axles, and were approximately 6 inches long. Opening hoods, crude engines and folding windshields were also features of these models. A spare wheel was mounted on the passenger side, and there was a steering wheel which was vulnerable to being broken off. See also a rear view and underside view (100K JPEGs). 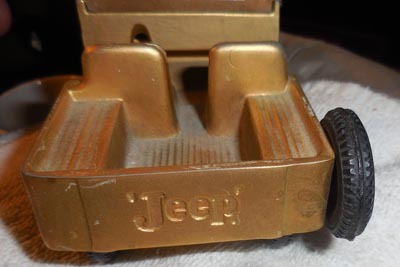 Gold plated versions of these CJ-5s were reportedly given to Jeep plant employees at their retirements. It's not clear what the actual gold finish was. 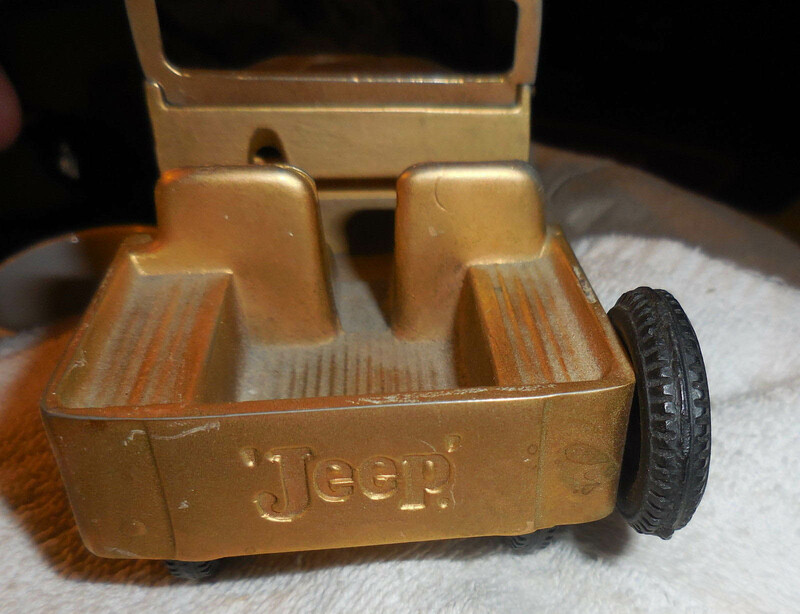 The Jeep name cast on the tailgate of the gold model does not appear on the red version, above. See also a front view and underside view (200K JPEGs). Thanks to ourfinefinds on eBay for these photos. Comet made Pink versions and blue/white versions of the Surrey, with whitewall tires, a non-folding windshield, and a feature seldom found on toy versions -- the vinyl windshield support straps. See also a side view with Surrey fringe (40K JPEG). Comet also made an FC stake mail truck with dual rear wheels and a plow (no stopping the mail), and a single rear wheels version (10K JPEG). 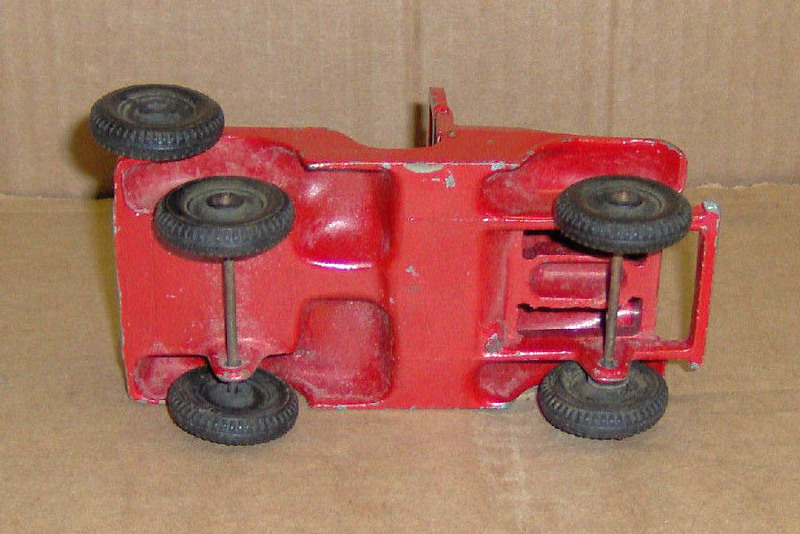 Having the same rubber wheels as the Comet Jeeps, this M715 truck model is identified as made by Banthrico in 1969. 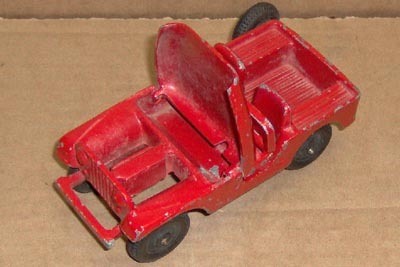 Banthrico was a cast coin bank manufacturer that made various coin bank vehicles for dealerships. The lack of a coin slot seems out of character for this manufacturer. The story I have heard is that it was meant to be a promotional item to entice the military into purchasing the vehicles. Banthrico also produced a DJ-5 Postal Jeep bank (20K JPEG) in 1974. 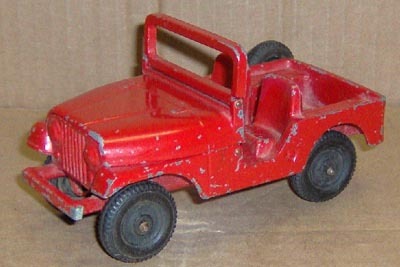 Sometime after Comet stopped producing the CJ-5s, the Toledo Jeep plant produced its own Jeep model casting. 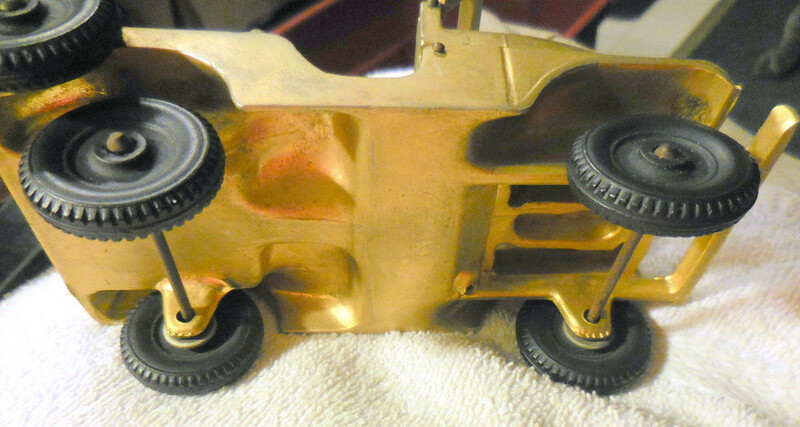 Solidly cast, including the wheels, the brass Jeep had a folding windshield. This particular model was photographed at the Jeep House Museum in Toledo. Just like the gold-plated Comets, these CJ-5s were given at retirements and VIP tours of the plant. The dies for this model (15K JPEG) were intentionally destroyed (diagonal cut seen in the photo) prior to Chrysler taking over the plant. Other promotional items that could be found in the top selling Jeep dealerships were dealer awards given out by Jeep Corporation to their best performers. 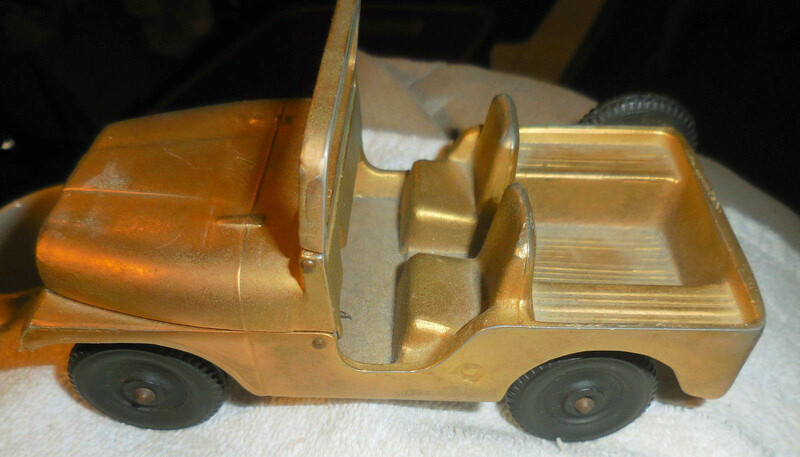 This 1950 Willys Dealer award is a gold-plated 1950 Wagon. "Top Ten Club - 1970 Northwest Region, Jeep Sales Corporation," awarded to Brooks Pontiac, Helena Montana. Promotional items were not limited to models, as various ashtrays were also made. One can just imagine how many cigarettes were butted out in ashtrays similar to this one just prior to signing the deal on a brand new Jeep. 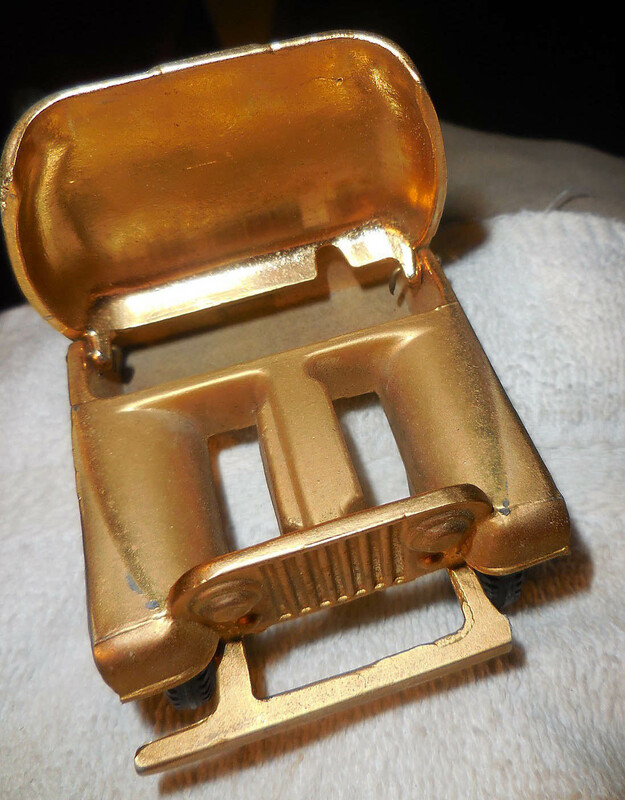 Again, although the CJ-5 may have been the most common, there were other versions including this FC-170 ashtray (70K JPEG). Clarence Young Autohobby is an excellent place for info and dealer promos for sale, grouped by years. Promotional Cars & Trucks 1934-1983: Dealership Vehicles in Miniature by Steve Butler, Schiffer Books (ISBN: 0764312324). 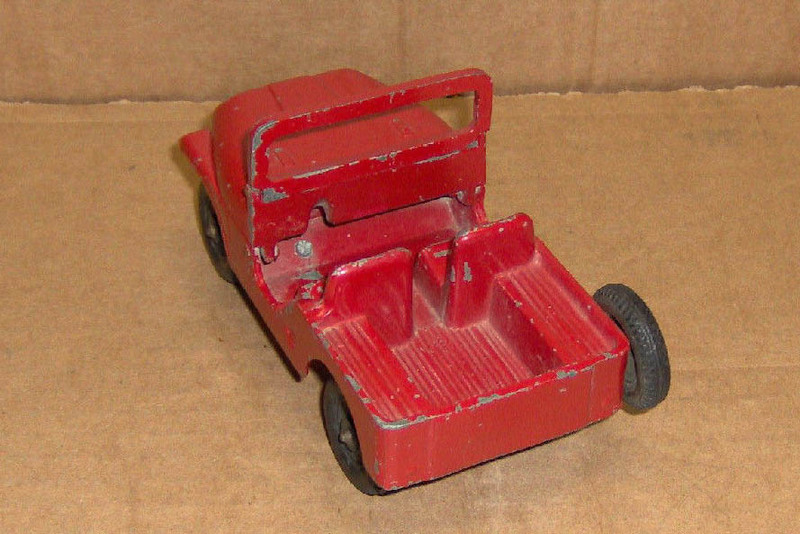 Ebay has a "promo" section under the models sub-category, but don't forget to check general automobilia sections, not only on-line, but at the toy shows and flea markets as well.